Half hour classes are only available to children 7 and under. Saturday and Sunday classes are $2.00 additional. We start teaching at the age of 3. We ask students to wear hard-soled shoes, or preferably boots. Rider weight limit 225 lbs. Please give us a call if you require any additional information. 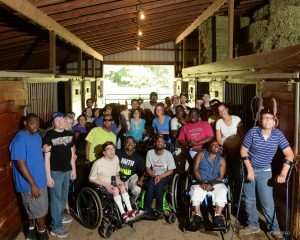 We provide ½ hour private horseback riding lessons for children with special needs. The cost is $42.00 per ½ hour class. We do require a deposit of one lesson to hold an ongoing time slot for a weekly lesson. We do not have sessions. We teach year round classes. You may start and stop at any time. We require one week’s notice to schedule a class. Please call for more information or to schedule a lesson time. Special thanks to Fairfield Photography, LLC for this photo.